All of the caves in the preserve are formed in Mississippian era Redwall Limestone. This limestone was deposited some 330 million years ago when this area was covered with a great sea. Over time the colorado plateau was uplifted and sea levels fell resulting in the large hills and mesas of the area. The caves most likely formed at a time when the water table level was static at the depth of the main cave passages. Current theories postulate that deep level hydrogen sulfide gases worked upward and mixed into the upper level water table. This resulted in a weak acid that dissolved the limestone to create the voids we see today. Later, surface water from rains would also act as a weak acid to dissolve limestone and carry it downward into the cave passages. This calcium laden water would then precipitate out the calcium when it made contact with the air in the cave. 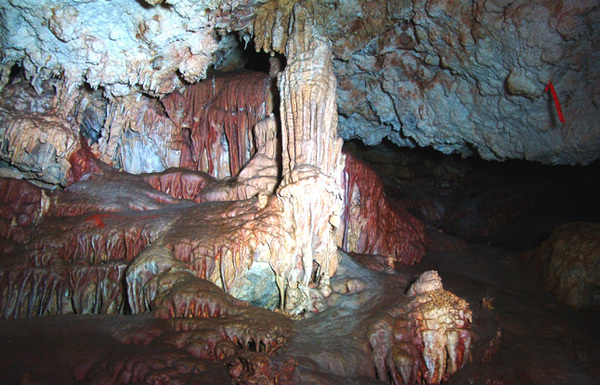 This is what forms the beautiful formations throughout the caves. This is just a basic explanation of the speleogenesis of the caves, as there are many more complicated processes involved. There are a variety of cavers and geologists currently studying our caves and karst systems, and over time we will further understand and document these fascinating features.